Route 25A to Port Jefferson and back - the must do newbie ride of NY. 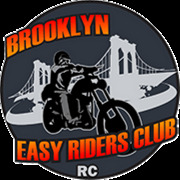 Brooklyn Easy Riders Club (BkER) is an American Motorcycle Association chartered Motorcycle Riding Club that meets irregularly, consisting of all levels of experience, equipment, race, gender and/or species. V-star, boulevard, Boneville, gtr, monster, vr? - we don't discriminate. All we want to do is have fun, share the ride and enjoy life. We'll teach you, we'll trim you, we'll help you, we'll ride with you. Sunday's the best, Saturday we'll do our best. Safety first! is our motto. And we don't leave any men ﻿behind - or women for that matter.